The dome on the Bradford County Courthouse was restored with copper panels during the first phase of a $3 million renovation project. Photos: Charles F. Evans Roofing Company Inc. The octagonal dome atop the Bradford County Courthouse has been a fixture on the Towanda, Pennsylvania, skyline for more than 120 years. It now shines brightly after being restored with copper panels as part of a $3 million renovation project. Built in the Classical and Renaissance revival styles in 1898, the four-story courthouse was placed on the National Registry of Historic Places in 1987. 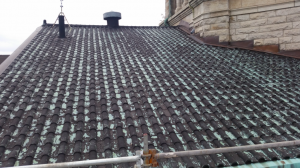 The dome’s original roof tiles were recently replaced as part of the project, which also included the complete restoration of the structure’s main roof. 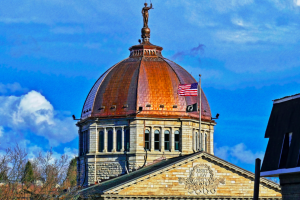 The Charles F. Evans Company Inc., the union division of Evans Roofing Company Inc., headquartered in Elmira, New York, has a long history of successfully tackling projects with historical significance. C&D Waterproofing Corp., the general contractor on the project, reached out to the firm for support assessing the roofing portion of the project. 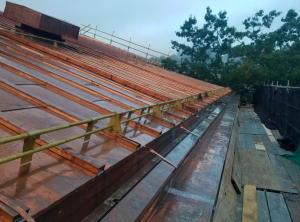 The two companies teamed up on the project, with C&D Waterproofing handling the masonry restoration work and Charles F. Evans Company installing the roof systems. The roofing work consisted of two phases. 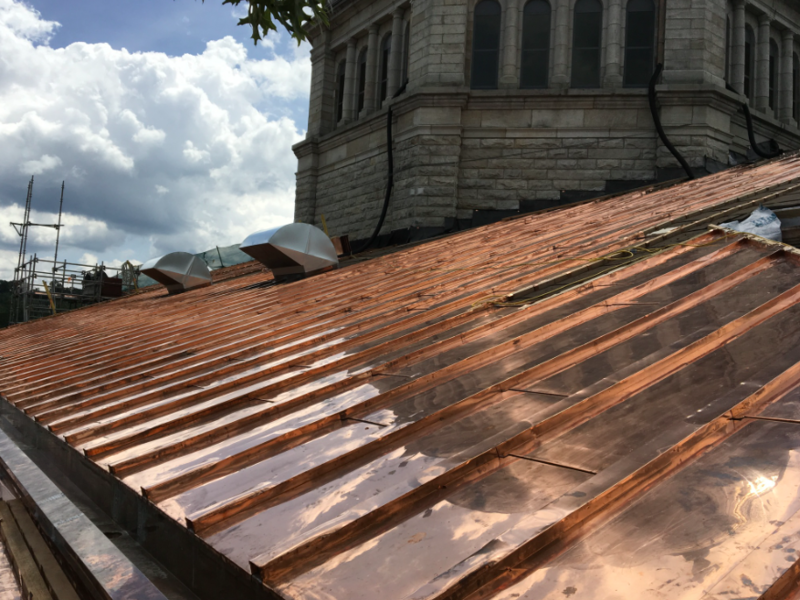 Phase One, which began in April of 2016, involved replacing the deteriorated terracotta tiles on the dome with soldered flat seam copper panels. Phase Two, which began in April of 2017, involved installing batten seam copper roofing on main structure and new copper flashings, gutters and downspouts. Originally completed in 1898, the courthouse was placed on the National Registry of Historic Places in 1987. The building’s main roof was removed and replaced with a copper batten seam roof after work on the dome was completed. Photos: Charles F. Evans Roofing Company Inc. 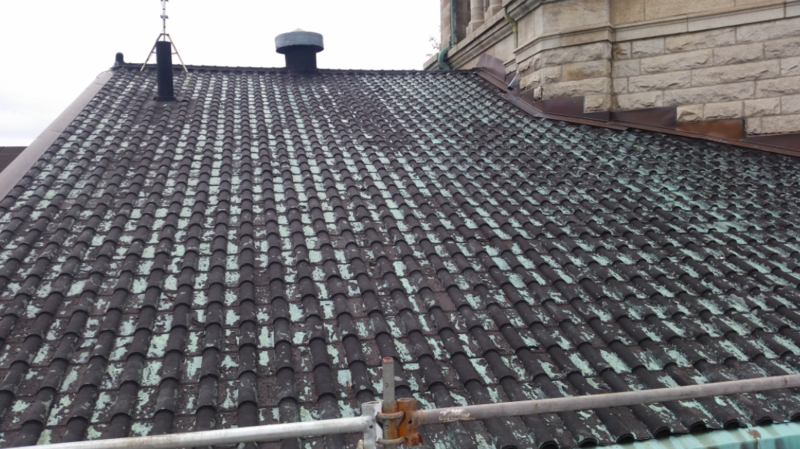 Phase One began with the removal of the tiles on the dome. “The ceramic tile was laid over open steel purlins,” Burge notes. 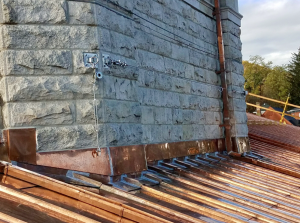 Charles F. Evans Roofing Company handled the roofing portion of the project, while C&D Waterproofing Corp. served as the general contractor and performed masonry restoration work. Photos: Charles F. Evans Roofing Company Inc. The removal work had to be done in sections and dried in every night. “One of the hardest things about this process was we had to install two layers of half-inch plywood over the steel purlins and anchor those down,” says Burge. The plywood was attached to vertical two-by-fours, which were screwed into the purlins. The plywood was covered with one layer of Warrior 30-pound felt paper, Meadows Red Rosin Paper, and Grace Ultra High Temp underlayment in gutter areas. The built-in gutter at the base of the dome was torn out and re-framed. The new gutter was wider and deeper according to the recommendation of Levine & Company Inc., the architect on the project. “We did everything to specification as Levine & Company drew it,” says Burge. 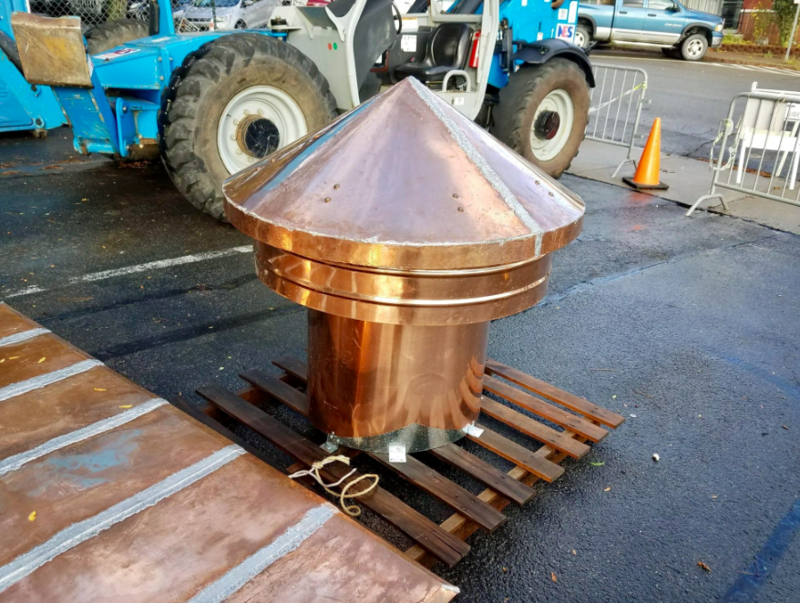 Custom flashing pieces were fabricated and installed where the copper roof panels met the base of the dome. Photos: Charles F. Evans Roofing Company Inc.
to the adjacent panel fastened to the deck. At the top of each panel, a hook clips off to the plywood, and the hook is covered by the panel directly above it. Scaffolding systems were constructed for both phases of the project. Shown here is part of the system installed around the lower roof, which featured planks and guardrails at the eave and rake edges. Photos: Charles F. Evans Roofing Company Inc.
Crews installed 1.5 inches of polyiso insulation between the two-by-fours, followed by another 1.5-inch layer of polyiso. Pieces of 5/8-inch plywood were then screwed down to the sleepers. The plywood received 30-pound felt, and the battens were installed 20 inches on center. The seams were completed using a custom-designed mechanical seamer manufactured by Roll Former Corp.
A scaffolding system was the key to the safety plan for both phases of the project. 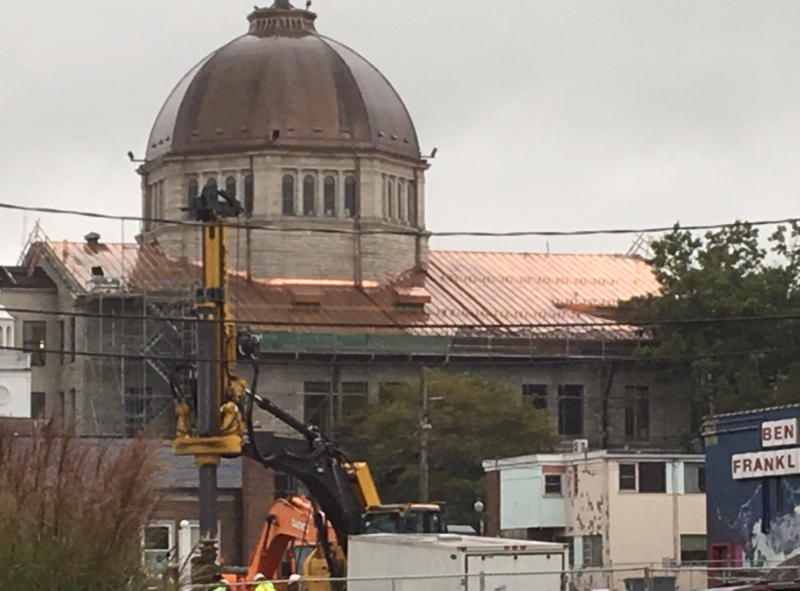 “For Phase One, we had to remove a portion of the roofing system and put down some plywood on top of the existing roofing in order to build a scaffold to access the dome,” Burge says. This photo shows the main roof before restoration work began. Photos: Charles F. Evans Roofing Company Inc.
After Phase One was completed, the scaffolding was removed, and another scaffolding system was installed around the entire lower roof. Phase Two required planks and pre-engineered guardrails at the eave and rake edges. 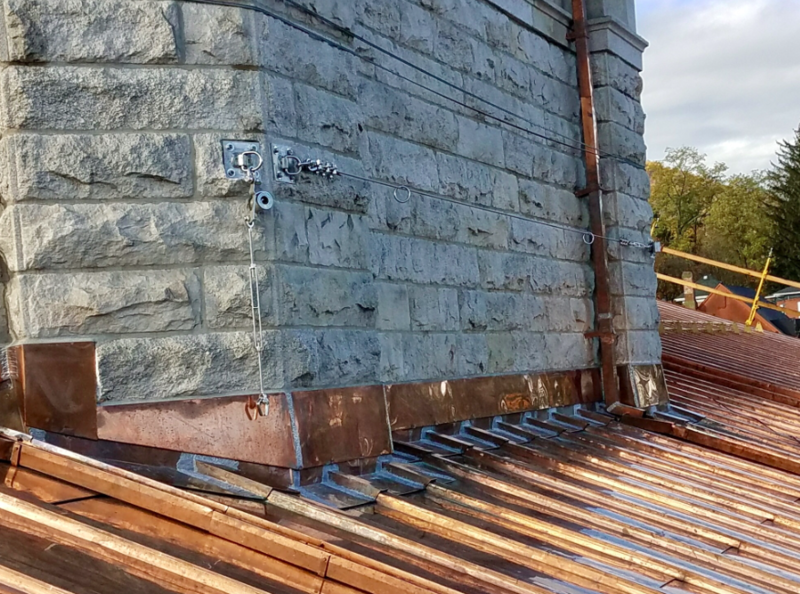 “Part of process of installing this roof included installing new safety anchors at various locations, and as we finished up, we were able to use those anchors as tie-off points,” Burge points out. Copper panels, cladding and details were fabricated in Charles F. Evans Company’s metal shop. Photos: Charles F. Evans Roofing Company Inc.